This is a very good option in comparison to RS:-7000/-. The phone performs well with 3 GB of RAM and 16 GB of ROM. The front facing camera is quite well (specially in manual and beauty mode), the rare camera is able to capture standard quality image in daylight, but not as well in night or flash mode. Though the 2700 mAh battery doesn&apos;t performtoo good, still is well. It will easily run one complete day if you don&apos;t switch on the mobile data most of the time, whereas enabling it all the times it will run 15-20 hours without charging. The display quality is good with coolUI 6.0. And the most amazing thing is the fingerprint scanner which can identify upto 5 fingerprints at a time. The fingerprint sensor is quite well. one of the best fits in between 7000/-. fingerprint scanner performs quite well. gets heated while gaming or using mobile data. rare camera doesn&apos;t perform like 13 mp quality and specially in flash mode, its not upto the mark. batttery drains usually faster while mobile data is enabled. takes a bit more time while charging in common mode. This is good mobile but only problem with battery.less stand by whipe compared to any other mobile. This Mobile Is Very Awesome. I have been using this cell phone since last 1 year. It work very smoothly and efficiently. I really love this phone. I think for the people with the low budged looking for some great features then you should go for it you&apos;ll love it. I bought this product for my brother for his birthday and i might say that this gift of mine didn&apos;t disappoint him and even after an year his mobile still functions as a new one. 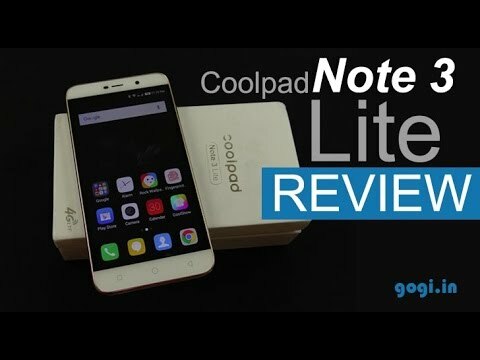 4 Pricebaba users have written their experience with Coolpad Note 3 Lite. If you own Coolpad Note 3 Lite, please do leave your feedback too. Coolpad, the Chinese Smartphone manufacturer surprised us with it’s Coolpad Note 3 that came with a fingerprint sensor under the Rs. 10,000 price bracket last year. This year Coolpad is back with another surprise with the Lite version for the successful Coolpad Note 3. This Lite version is priced comparatively cheaper & yes, it does & surprisingly it has a fingerprint sensor too. The Coolpad Note 3 Lite has a 5” Full Laminated IPS HD (1280x720 pixels) resolution display giving it a pixel density of 267PPI & is protected by a Scratch resistant glass & supports multi-touch up to 5 fingers. The phone on the inside runs on MT6735 which is a Quad Core chipset clocked at 1.3GHz & has great 3GB RAM. On the rear there is a 13MP camera sensor that can record videos up to 1080P & on the front is the 5MP shooter for those quick selfies. Coolpad Note 3 Lite is powered by a 2500mAh battery & supports Dual SIMs that are 4G enabled. The phone has internal storage of 16GB that can be expanded via a MicroSD card up to 32GB. The Coolpad Note 3 Lite runs on Android Lollipop (5.1) out of the box with Coolpad’s CoolUI running on top of it. The device is available in Champagne White & supports FM Radio as well. Ans: Yes, it comes with a removable battery. 2. Does Coolpad Note 3 Lite work with Reliance Jio Network? Ans: No, it doesn’t work with Reliance Jio Network, even though it’s a 4G-enabled device. Although, Coolpad has promised to bring Reliance Jio Network support with their new Marshmallow update. 3. Does it support OTG? Ans: Yes, it’s a OTG enabled smartphone. Ans: No, Coolpad Note 3 Lite comes with a dedicated slot for MicroSD card up to 32GB. 5. What type or charging connector do I need? Ans: It sports a micro-USB charging connector. Ans: It was launched with Android 5.1 Lollipop and never received an update from Coolpad. 7. How is the camera performance for this phone? Ans: It sports a 13MP rear camera which supports Full HD video recording and also features a 5MP front camera for selfies. The rear camera performance is average but the front facing camera does performs well, especially with beautify mode.